Los Angeles city councilmember Marqueece Harris-Dawson announced that the intersection will become "Ermias 'Nipsey Hussle' Ashedom Square." LOS ANGELES -- The intersection of Slauson Avenue and Crenshaw Boulevard will be renamed in honor of the late rapper Nipsey Hussle. The intersection is near the site where Hussle (legal name: Ermias Ashedom) was murdered in front of his store, Marathon Clothing, on March 31. 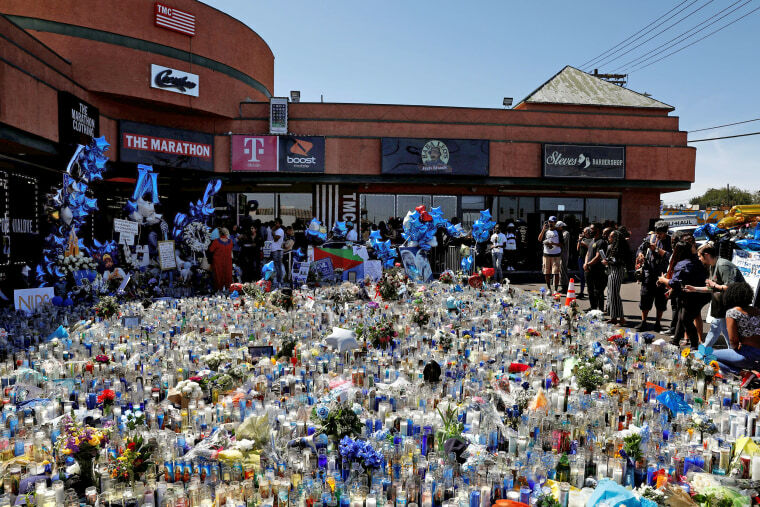 Los Angeles city councilmember Marqueece Harris-Dawson announced that the intersection will become "Ermias 'Nipsey Hussle' Asghedom Square," as reported in The Shade Room. The decision came off the heels of an online petition to change the intersection name in honor of the slain rapper. Harris-Dawson said in a statement, "Nipsey's genuine nature allowed him to be a light to everyone he interacted with from family, friends, fans, and his larger community. As a father, brother, and son, Nipsey was a rock helping to build an empire that will continue through generations. Nipsey will always be remembered for delivering a pure, authentic Los Angeles sound, his numerous philanthropic efforts, his innovative, community-focused business mindset, and his humble heart. " A memorial for the rapper will take place at the Staples Center in Los Angeles this Thursday. The late rapper's family confirmed the memorial today and the venue posted details on its website (please refer to it for complete information). While Hussle was a Grammy-nominated rapper and a long-established figure on the hip-hop scene -- he released his first mixtape in 2005 -- his musical influence is overshadowed by his work as an entrepreneur and businessman, and particularly his influence on his home neighborhoods in South Los Angeles. He owned many businesses in the area and was renowned for his kindness to the community, giving jobs to struggling residents, donating money and clothing to a local elementary school.